It'd been so long since I'd read epic fantasy, I couldn't resist this one. And I love that cover! An outstanding, game-changing epic fantasy debut featuring an unforgettable female warrior. Visit this site to read the first few chapters! 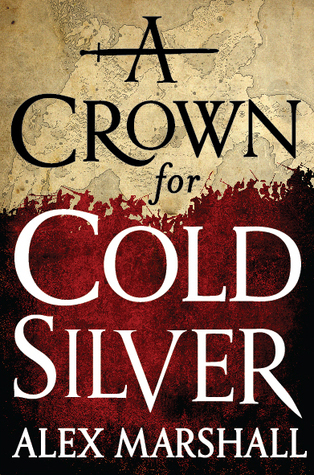 A Crown for Cold Silver weaves together multiple characters' perspectives to tell a tale that crisscrosses the Star, the region the book is set in. I didn't have a great mental picture of the exact geography of the world, but that didn't bother me. With so much travelling back and forth, and so many characters doing that travelling, I trusted in the author to keep the pieces straight. Epic fantasy is a much bigger time investment than the romances and even urban fantasy books that I usually review here. That had a direct impact on how I read this book - it was over several days instead of my usual one or two, and in chunks. I have to admit that this had a negative impact on my reading. I found it difficult in the first third or maybe even half of the book to keep all the characters (especially the minor ones) straight. Written in limited third, the spotlight shifts between several different (and quite colourful) characters. Each of the different story lines weaves together into an awesome story of revenge, ambition, and (of course) war. I absolutely had my favourites, but I found myself impatient to return to each of the different perspectives at some point during the book, wanting to know what happened next *now*! That's pretty remarkable - normally, I find in these big cast books that there are at least one or two that I could do completely without. Every perspective is united through this delightful, snarky sense of humour that raised the bar for entertaining. One of the things I really loved about the book was that Crown gives us aging adventurers who are still badass, but who are also very human and becoming aware of their advanced ages. This isn't to say that everyone in the book is on the retired side of life, but there are a few who fall outside of that 'young, new-to-the-lifestyle' age group, and who *aren't* cast as aged, wise old men and women. The book also does an amazing job of building legends - Zosia and her Villians - and then deconstructing them so I could understand the truths at the core of these legends, but also the reasons why the legends grew, and how they were manipulated to benefit Zosia and others. The worldbuilding is amazing, the characters are incredibly diverse, and the story crafting is exceptional. I also love how Crown takes some huge concepts - like big battle scenes, and war councils and such, and somehow manages to make them intimate. I never felt lost in the larger action, but instead, even in the heat of battle, found myself engaged in the smaller moments within that big picture. The book is also much darker than the typical epic fantasy. Yes, it has the action and familiar quest and revenge tropes, but there's also a grittiness to the world. One example, drug use seems to be rampant, and rather creative as it relies on toxins from various critters and creepy crawlies. Now, I wanted to find out more about the author, and found out from the Hachette website that this is a pseudonym for a bestselling author who has previously published in other genres. I do not think I could be *more* curious about the real identity of the author. 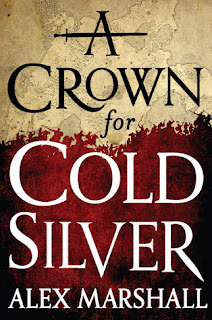 If you're a fan of fantasy, I strongly recommend you check out A Crown for Cold Silver. It's a huge story with a large cast of characters, but told in a very intimate, engaging way. Familiar themes are explored in a grittier world than epic fantasy usually features, with a whole lot of darker aspects - drug use, demons, revenge, guilt, disappointment - and not a lot in the way of wonder and light to provide relief. Instead, I looked to the growth of characters, and the formation of friendships and other bonds for balance.